The man who was behind Windows 8 thinks that sales of Microsoft's newest operating system aren't all that bad seven months after its launch. "It's hard for me to look at selling 100 million of something and not be happy," said the former President of Windows division, Steve Sinofsky, according to AllThingsD. "It will take a long time for things to play out," he cautioned at the D11 conference. "It's exciting but it means while it is going on you have to resist the urge to pick winners and losers." Sinofsky's former company revealed that Windows 8 reached 100 million sales in its first six months of availability. Microsoft also revealed where its OS is going in the future with 12 big changes in Windows 8.1. When asked to comment on Apple and Google, Sinofsky said that there are positive and negative challenges at both of Microsoft's rivals. "It's beautiful to use an iPhone - as long as you want do the things it supports," he said digging in at Apple's lack of developer and user customization. Sinofsky also commented on the newly confirmed redesign of iOS 7, which involves Apple's Jony Ive and is rumored to have a flat, non-texturized look. "[At Microsoft], it was exciting to be part of a project that changes the design paradigm," he said of the Windows 8 and Windows Phone 8 flat look that a skeuomorphic-free iOS may adopt. "If people follow, it can be even better." 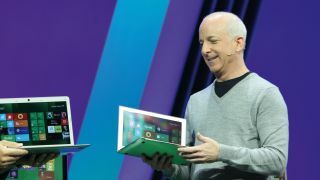 Sinofsky held up a Surface RT tablet, which he helped spearhead while at Microsoft, but he also pulled out an HTC One smartphone during the D11 conference. "Using this Android phone. It is amazing in its openness and all its variety," he said, commenting that having many people be part of Google's success is "a big force multiplier." "[But] the subtlety of being open is hard to get across. There are nefarious app developers out there. Not malware but just developers trying to make their app get seen." "They might have a great calculator but they want to show up everywhere." Asked whether he thought about joining Google or Apple follow his departure from Microsoft, Sinofsky deflected the question. "Right now I am in learning mode." "The industry is undergoing a tremendous amount of change," he said earlier in the D11 interview. "I think that is exciting and it means a lot of opportunity." But that opportunity will have to wait for Sinofsky, who concluded, "I'm not in a big rush."